New research proves that adding eggs to a salad can create a faster recovery rate. The American Journal of Clinical Nutrition recently came out with a study indicating that adding eggs to your salad can increase the absorption of carotenoids. Wayne Campbell, professor of nutrition science at Purdue University says, "Eating a salad with a variety of colorful vegetables provides several unique types of carotenoids, including beta-carotene, lutein, zeaxanthin, and lycopene." The fat content in eggs triggers a greater absoroption of the cartenoids, reducing oxidative stress. Less oxidative stress means a faster recovery rate post-workout. In the study, 16 participants ate three different salads: one with no eggs, one with eggs, and a salad with three eggs at various times. Each salad also had three grams of canola oil, but the second salad had 75 grams of scrambed whole eggs while the third had 150 grams of scrambled whole eggs. Results: the rate of carotenoid absorption was 3 to 8-fold higher when the salad had eggs compared to none. Campbell says, "We believe the results would be comparable as long as the egg yolk is consumed." Go light on the salad dressings but pack on the eggs -- one egg contains 70 calories and 6 grams of protein. 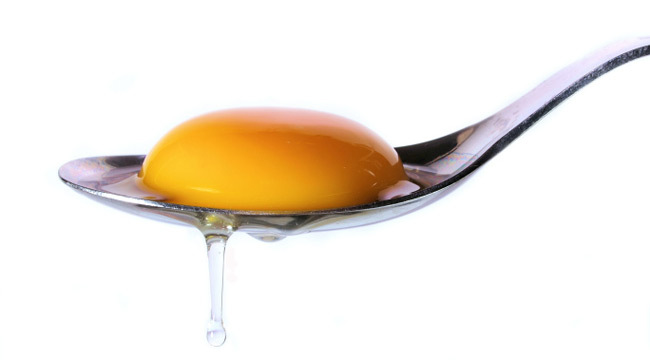 Also, the yolk is the more nutritious part of the egg -- loaded with essential muscle-building vitamins.